Making California a Sanctuary for All! We live in an evil America. It is an evil America where racists and hate-mongers rule. That “fake president” Trump with his racist demands that innocent children be deported to a life of despair in distant foreign lands, that parents be separated from their children, brothers from sisters, mothers from their daughters. He has attacked the homeless and will starve these helpless masses to death. He has attacked the LGBTQ community. He has attacked the life-saving efforts of Planned Parenthood. Only California stands between Compassion and Genocide! We must finally stand up to the evil and stand up for the love and hope that is in all of us. One Race, One World, one People! There is no way we can save all of America or even all of California. We must fight where we can win! For generations the word “Coexist” has been on bumper stickers and in our hearts. But “Coexist” has not worked. It is time to take action and do what will work. We must take action … NOW! We must create a land of love and diversity that is protected and that is secure, and deep in the heart of California. We must create a place where the homeless can be safe. We must create a place where the undocumented can be safe. We must create a place where the LGBTQ of this land can be safe and gather together and become strong and fight for their rightful place on this earth. 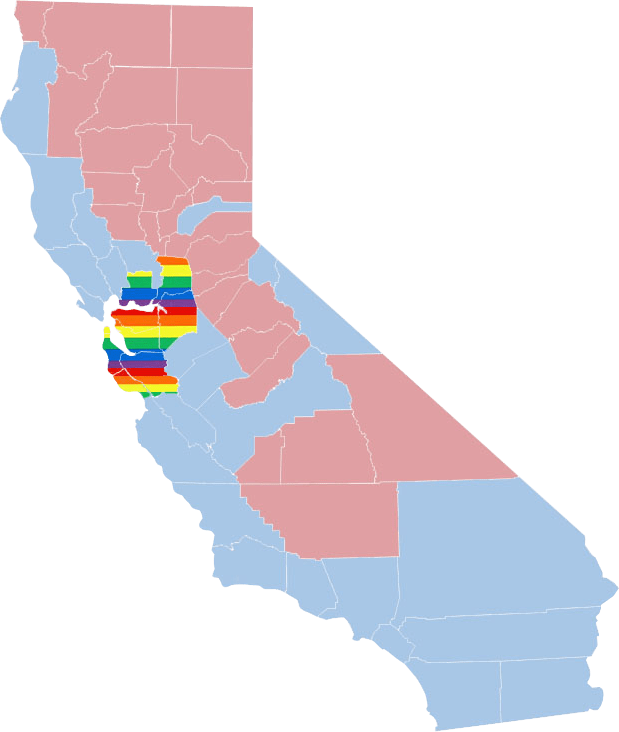 At the heart of California are nine counties: San Francisco, San Mateo, Santa Clara, Santa Cruz, Alameda, Contra Costa, Solano, Sacramento and San Joaquin. Those nine counties are five thousand square miles of verdant grapes, luxurious almond trees and marvelous loving people. There, people from more than one hundred different lands all live in harmony. There, over a hundred different languages are spoken. There, over a hundred different cultures vibrate with life and vigor. There, we can be safe. Our plan is simple. Let the “Red States” hate! Let the “Red States” do their worst! We will bring Our People … here. We will bring them all to this singular bastion of hope! These nine counties in the heart of California can be a true Sanctuary for all. The political and economic power held by those nine counties makes us the most dangerous threat to Trump and to all the racists and bigoted hate-mongers in this country! Those nine counties represent Google, YouTube, Facebook, and Apple. Those nine counties represent companies that generate more than half of all the money seen on the Internet! Those nine counties control what Google says, what YouTube says, what Facebook says, and even what is available from Apple! What we see in the news is controlled by the people in those nine counties. What is said on Facebook is controlled by the people in those nine counties. What congress does is controlled by the people in those nine counties. We control those nine counties and we control America! Our California Sanctuary Zone is comprised of those nine counties and it is so rich and powerful it actually has a larger economy than France! By building our California Sanctuary Zone, we create the most powerful and diverse population ever seen in the history of this planet. Finally, we will be safe! Won’t you help us bring our huddled masses to this Promised Land? Our Mission and this website are dedicated to bringing them all to California and to safety. The pages on this site show you how to create the most powerful engine for Peace and Love ever seen on earth! By bringing Our People together in this Promised Land we become the most powerful political force ever seen on earth! If you take action, if you help, you can save millions from certain tragedy and even death. If you take action you can create a force for freedom and love that cannot be stopped and will let us all prosper here in California. This website is … The Action Plan to make this happen! This website is … The Freedom Manifesto we need! Write your county supervisors, write your congresspersons, write that vile Attorney General Jeff Sessions, and demand that California be given SANCTUARY and COMPASSION in just those nine counties which are the very heart of California. If we do this, we can even get them to halt all federal funding of Black-murdering Pigs, and instead send that money to those nine counties to support food and housing and care for the innocents seeking our help.